There are many elements that make up a wedding. Picturesque venue. Stunning dress. Beautiful flowers. A delicious cake. And of course all your wonderful friends and family there with you. It would be biased of me to say that music is the MOST important factor on your big day. But I do guarantee one thing – live entertainment will enhance your day significantly! It is unique. Everyone has their favourite piece of recorded music, whether it is to dance or relax to. But a live performance is a one off; it cannot be recreated, and has been put together specially for you. When it comes to walking down the aisle or your first dance, live music will be the soundtrack to two of the most memorable moments in your life. Click the link to read more about a wedding ceremony in Italy that I recently performed at. Flexibility for guests. A live singer is able to read the atmosphere of a wedding perfectly, and can adapt a set so that songs are more laid back and chilled earlier on in the day, or full of energy as the night progresses. Read about my 5 top acoustic wedding songs HERE. Are you not entertained?! Sure, wedding guests have joined you for big day to celebrate with family and friends, but they have also come to be entertained! 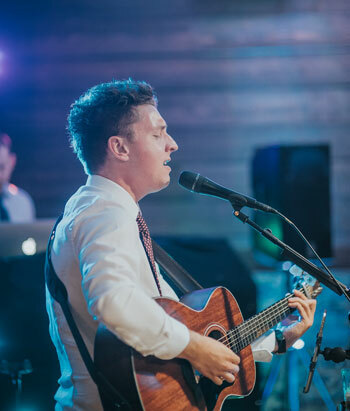 Having live music at your wedding can add an unexpected touch that they will be sure to tell everyone about once the day is over.